Red Cross, Haiti houses: Permanent dwellings not constructed despite massive fundraising, ProPublica says. 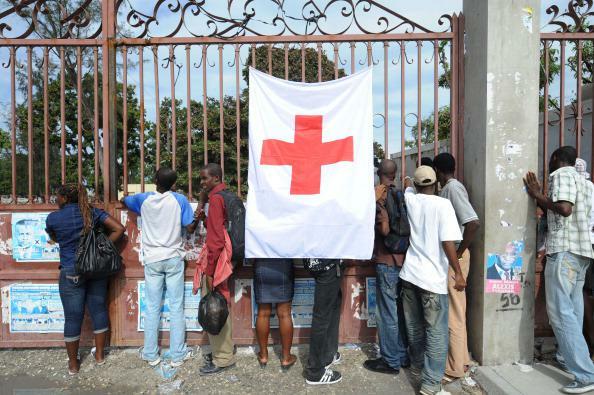 Outside a Red Cross cholera field hospital in Carrefour, Haiti, in 2010. The muckraking journalism site ProPublica has printed a number of highly critical pieces about the Red Cross in the last year, covering subjects including the august charity institution’s low morale and seemingly ineffective response to Hurricane Sandy. On Wednesday, ProPublica and NPR released another such scathing article, this one addressing the Red Cross’s (alleged) failure to efficiently and meaningfully spend the $488 million it raised for Haiti relief after that country was devastated by an earthquake in 2010. The piece discusses a number of troubled relief programs launched by the organization, but the biggest takeaway factoid is this: Two high-profile Red Cross announcements of projects to build permanent homes in Haiti have led to the construction of only six homes—total—while other aid agencies have built thousands. That lack of expertise, ProPublica/NPR’s investigation finds, involved both a failure to hire Haitians with on-the-ground knowledge and a dearth of high-level planning competence. Top officials are also accused—as they have been in other ProPublica articles about the Red Cross—of being misleading, evasive, and unreliable in public statements about how money has been spent and how much aid has actually been provided. Read the whole investigation here. Update, Thursday, June 4, 2015: The Red Cross has released a statement responding to the ProPublica/NPR piece. The Red Cross is disappointed, once again, by the lack of balance, context and accuracy in the most recent reporting by ProPublica/NPR, which follows the pattern of all their previous Red Cross stories. It is particularly disappointing to see our work misrepresented considering we answered more than 100 questions in writing and provided an interview with the head of our international programs.